He makes scratching an artform that everyone can enjoy; one of the pioneers of turntablism. so you've heard of q-bert, mix master mike, craze, the beat junkies and thought they were ill? well...add dj t-rock to that list...at the top. tell your friends, this is turntablisms best kept secret and most overlooked dj of the past decade (not for long). t-rock makes scratching an artform that everyone can enjoy. he cuts and scrapes his way through original soundscapes by combining rhythmic patterns with clever themes to create incredible scratch music. 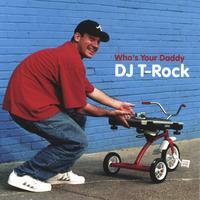 "who's your daddy" is one of the first records of the turntablist movement and will stand the test of time. t-rock delivers a classic album. I really like this CD. I will definitly look forward to future releases. This dude is a scratch expert! Love his work. Great album...period one of the first of its kind when Bomb hip hop records started to put out these albums, for fans of thsi genre cop it, as album hard to find at this price!